Rix Distillery! : Personal: A Stent in Time Saves...Me? The procedure itself was uneventful. It's NOT as dramatic as open heart surgery. Last month I was "at risk" for a heart attack. I am less so, now. When I was finally released to go home, I was been told to "take it easy" for a week. After that I can return to any level of activity. That includes (gasp!) exercise. Sometimes I miss the treadmill habit I had gotten into several years ago. I'm going to be on daily meds for at least a year, and probably for the rest of my life, but I've been a daily light dose of blood pressure medicine (lisinopril) since 2013, so I'm only adding to an existing habit instead of learning new patterns. So, like most guys, especially guys my age, I publicly down-played this procedure. I mostly pretended to everyone, and to myself, that this was minor event in my life. All along I insisted to my world that this was on par with a dental root canal: they use a local anesthetic, I'd stay awake during the entire procedure, and a couple hours later I'd be able to return to my world. The heart catheterization itself really was that mundane, after all! But it was amazing nonetheless. They actually touched my heart through a small puncture in my wrist, and inserted a small piece of metal that expanded not unlike the old Chinese finger puzzles. 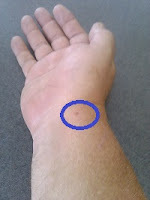 The only evidence 24 hours later was a small dot on my wrist. And, my life is supposed to be better, and longer. I had not had a "heart attack"
About a month ago I had an annual appointment with my heart specialist. I told her about some recent chest pains that seemed to be relieved by 5-10 minutes of continuous belching. I had an EKG, and it was no different from any of the previous EKGs had taken at the clinic over the last decade. In other words, nothing to indicate a heart problem. Dr. Amin concurred with my self-diagnosis of heartburn and indigestion. She suggested a stress test "just to make sure." Because she was leaving her position, she suggested sooner rather than later. It was scheduled in just a couple. When I met with Dr. Amin the following week, she informed me that the test results were abnormal. Uh Oh. The next test, of course, was a heart catheterization. This involves inserting thin tube through a vein in the arm or leg to pump dye directly into the top of the arteries in my heart. There is a lot of cost in doing this, and the paperwork for insurance coverage took a few days to process. But even with that, I was on my way to the cath lab 8 days after I was told about the abnormal results of my stress test. I Googled the procedure, of course. There is a lot of information online. YouTube has videos of the entire procedure, and they are well worth watching. I arrived at the hospital at 7:15. An hour later I had completed the paperwork was a wearing a only hospital gown (yes, the kind that's open in the back). My girth often pushes shirts open between buttons, and this happened to the opening in the back of my gown. I spent most of the day laying on my back, so the only time a rear view was a problem was my one walk to the bathroom in the afternoon. At 8:30ish yesterday, I was in the lab where the heart catheterization was to take place. The cath lab was white, bright, and a bit chilly. There were 4-6 people all actively involved in getting me and the room ready. 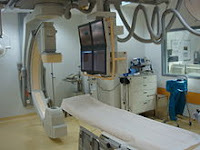 I was moved to a table that had an X-ray machine over my chest. There was a bit of a fuss while they adjusted the table extensions where my arms lay. This was not uncomfortable. I was flat on my back the entire time, and didn't see much of anything. 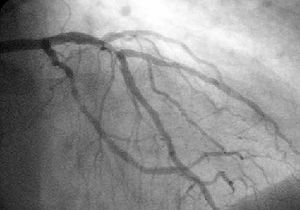 The doctor, called an interventional cardiologist, introduced himself and asked if I had any questions. No. I was vaguely aware of them working on my arm. Apparently they had used the IV to add a "happy juice" cocktail to my system. At the end of about 2 hours, they announced that they were done. They had found blockage and corrected it with a stent. They retrieved the X-ray pictures that they had saved on the monitor, and showed me where the blockage had occurred. By 10:30 I was transferred to the recovery area! I was told I would be discharged at 6:00pm (it turned out to be 5:30). They served me breakfast! They had a special pressure bandage over the entry area, and it took 3 hours to slowly release the air pressure. I had never seen that before. Interesting. When the air pressure was completely down, they applied a regular bandage. They let me sit up after lunch (yes, they fed me again! ), but kept me hooked up the the IV and heart monitors. Thankfully the instruments had long cords. I was bored and restless by mid-afternoon. The hospital offered free wi-fi, but I wasn't supposed to use my right wrist. But I did use my left hand. Even though I thought I was capable of driving, I was told not to drive for 24 hours because of the drugs they had used during the procedure. Mercy arrived about 4:30, and drove me home after my discharge. I had been awake, alert, and pain-free for the entire day: during the procedure, in the recovery area, on the ride home, and for the rest of the evening.